At HiyaWorks, our fundamental philosophy is “members first.” That value powers all of the decisions we make, including how we gather and respect your personal information. We’ve crafted the policy below to be as clear and straightforward as possible. Our aim is for you—our members—to always feel informed and empowered with respect to your privacy on HiyaWorks. View our California DNT notice. We are a social network and online platform for individuals having interest and expertise in various creative and artistic space. HiyaWorks’s mission is to connect the world’s creative individuals and groups (amateurs to professionals) to allow them to be more productive and successful. Our registered members (“Members”) share their professional identities, engage with their network, exchange knowledge and professional insights, post and view relevant content, and find career and casting opportunities. Content on some of our services is also visible to unregistered viewers (“Visitors”). We believe that our services allow our Members to effectively compete and achieve their full career potential at the same time have fun with friends and family. The cornerstone of our business is to focus on our Members first. We give you the power to share as part of our mission to make the creative world more open and connected. This policy describes what information we collect and how it is used and shared. We collect the content and other information you provide when you use our Services, including when you sign up for an account, create or share, and message or communicate with others. This can include information in or about the content you provide, such as the photo or a video or an audio file or a document or the description of the file that was uploaded / created or the Blogs that you have posted. We also collect your comments and various kind of ratings about others work, arts schools and their courses. We also collect information about how you use our Services, such as the types of content you view or engage with or the frequency and duration of your activities. Use of certain features of the Website may require submission of certain personal information, including your first and last name, email address, location details, contact information, social media identities, and a password. Non-personally identifiable Information Hiya may also collect or receive additional non-personally identifiable usage information specifically related to the use of a particular feature or offering on the Website, and responses to the offerings and advertisements presented on the Website. Hiya may also collect or receive (in some cases as part of the internet communication protocol) certain non-personally identifiable technical information, when the Website and pages are visited or when a Hiya client is used. Profile Information - We collect information when you fill out your creative profile. 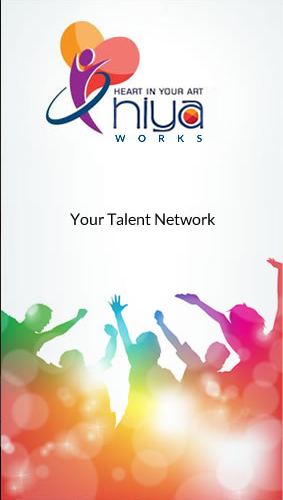 A complete Hiya profile that includes professional details – like your training / education, performances, accolades & awards, scholarships & sponsorships, recommendations & references, degrees & certifications, associations, media publications – helps you get found by other people for talent search and opportunities. After you create an account, you may update your profile information and also upload your portfolio of creative work, to shared amongst friends, peers, experts and public. Subject to the settings you choose, your connections may provide recommendations of you. Providing additional information enables you to derive more benefit from our Services by helping you express your identity; find other creative people, opportunities, contests and information; and help talent hunters and casting opportunities find you. It also enables us to serve you ads and other relevant content on and off of our Services. Customer Service - We collect information when you contact us for customer support. Log information - When you use our services or view content provided through our platform / application, we automatically collect and store certain information in server logs. cookies that may uniquely identify your browser or your Hiya Account. We also collect content and information that other members provide when they use our Services, including information about you, such as when they share a file with you, send a message to you, or add you as a group member or as a trainer or as a star student or rate your portfolio of work. We collect information about the members you are connected to and how you interact with them, such as the members you communicate with the most or the members you like to share with or art schools that you are interested in or event organisers that you follow. We also collect contact information you provide in your profile. If you use our Services for purchases or financial transactions (like when you buy subscriptions or other services), we collect information about the purchase or transaction. This includes your payment information, such as your credit or debit card number and other card information, and other account and authentication information, as well as billing, shipping and contact details. When you visit or leave our Services (whether as a Member or Visitor) by clicking a hyperlink or when you view a third-party site that includes our plugin or cookies (or similar technology), we automatically receive the URL of the site from which you came or the one to which you are directed. Also, advertisers receive the URL of the page that you are on when you click an ad on or through our Services. We also receive the internet protocol (“IP”) address of your computer or the proxy server that you use to access the web, your computer operating system details, your type of web browser, your mobile device (including your mobile device identifier provided by your mobile device operating system), your mobile operating system (if you are accessing Hiya using a mobile device), and the name of your ISP or your mobile carrier. We may also receive location data passed to us from third-party services or GPS-enabled devices that you have set up, which we use to show you local information (for example, events in your area or opportunities and contests in your location) on our mobile applications and for fraud prevention and security purposes. We may receive information about you and your activities on and off Hiya from third-party partners, such as information from a partner when we jointly offer services or from an advertiser about your experiences or interactions with them. We are passionate about creating engaging and customized experiences for people. We use all of the information we have to help us provide and support our Services. The information is used to operate and improve the features, offerings and content presented to you by Hiya, to personalize the content and advertisements provided to you; to fulfil your requests for products, programs, and services; to communicate with you and respond to your inquiries; to conduct research about your use of the Website; and to help offer you other products, programs, or services that may be of interest. Please note that Hiya may use your personally identifiable information to present offers to you on behalf of business partners and advertisers. However, while Hiya's business partners and advertisers may receive aggregate data about Hiya members, any personally identifiable information of yours will not be shared with third parties unless you have consented to the sharing of this information. We use the information and content you provide to us to conduct research and development and to customize your experience and try to make it relevant and useful to you. We use this to improve our Services in order to provide you and other Members and Visitors with a better, more intuitive experience and drive membership growth and engagement on our Services and to help connect creative entities and members to economic opportunity. We are able to personalize content, and make suggestions for you by using this information to understand how you use and interact with our Services and the members you’re connected to or interacting with and interested in on and off our Services. For example, we provide shortcuts and suggestions and recommendations to you, like recommended friends, recommended piece of creative work for you to explore, recommended learning options, suggested events and contests, relevant creative opportunities for you to pursue. When we have location information, we use it to tailor our Services for you and others, like helping you to find new friends near you, or Art Schools near you, or Talent near you or Events happening near you and so on. We communicate with you using Hiya messaging, email, and other ways available to us. We may send you messages relating to the availability of the Services, security, or other service-related issues. We also may send promotional messages to your registered Email inbox. You can change your email settings at any time. Examples of these communications include: (1) welcome and engagement communications - informing you about how to best use our Services, new features, updates about other Members you are connected to and their actions, etc. ; (2) service communications - these will cover service availability, security, and other issues about the functioning of our Services; (3) promotional communications - these include email, and may contain promotional information directly or on behalf of our partners, including events, contests, training institutes and art schools, opportunities and information from members that are hiring or searching for talent. These messages will be sent to you based on your profile information and messaging preferences. We track the open rate of your emails to provide your email acceptance score. You may change your email and contact preferences at any time by signing into your account and changing Hiya email settings. With certain communications, you send on our Services, the recipient can see your name, your profile details, email address, and some network information. Many communications that you initiate through our Services (for example, an invitation sent to a non-Member) will list your name in the message. Messages you initiate may also provide the recipient with your profile link & details and aggregate information about your network (for example, how many people are in your network). Once you have connected with an individual, your contact information will be shared based on your privacy settings. Our Services help you search for other creative people (peers and experts, potential trainers and students, possible audience), casting companies and talent hunters, groups, creative content, contests, events and creative opportunities & jobs. For example, you can find Members with particular expertise or experience, or Members that you may know from your Interest areas. You can also find casting opportunities and information about Talent Hunters. We use personal information from our Services, including Member profiles, portfolio of creative content, and User Pages, to inform and refine our search service. We offer a premium service to talent hunters and others, which can be used to search for, organize, and communicate with potential candidates or offer business opportunities. We offer customized people-search functionality as part of our talent hunting solutions. These services allow subscribers - generally, casting organizations, talent hunters, event organizers, art schools - to view Members public profiles, in order to effectively manage candidate sourcing. We do not provide email or other contact information to these subscribers. However, if you post that information as part of your profile’s privacy settings, it will be available to them and others. A talent hunter or other such subscriber may also manage and store information it has independently obtained about you outside of our Services, such as a resume, in connection with our platform. Any personal information obtained independently of our Services will not be added by us to your profile and is not under our control. Training Institute and Art Schools can create pages on our Services. As part of they can list their courses, trainers, students. If you send a general enquiry or course specific enquiry to the Art school, you will need to specify the contact details through which the Art School can communicate and respond to you and they will be able to access your identifiable information about you through profile view. If you follow a person or organization, you will be listed among its followers, which can be viewed by others including the page owner. We use aggregate information about followers and viewers to provide data about such pages’ performance (for example, visits and updates). As part of the Hiya ecosystem, members as well as registered Event organisers can post events. If you send an enquiry for an event or interest or like or share the event, the member (who has posted the event) or the event organiser will get to know your profile details. In case of enquiry sent, they can also see the contact information that you have shared with them as part of the enquiry message. You can share your portfolio of work by uploading your creative files in the form of document, images, audio and video files. As part of that, you can decide to share these files with friends, peers, experts, public or specific individuals. Based on this permission, other can view your creative work. Also these piece of creativity can be rated by friends, peers, experts, public or specific individuals based on permissions granted by you. Similarly, the ratings be viewed by friends, peers, experts, public or specific individuals based on permissions granted by you. While we have taken measure to disallow downloads of these creative files by others, it may still be possible to download the files using external tool. You should therefore be careful to create appropriate measure (in the form of watermark, or selecting editing, or summarisation, etc.) to avoid copyright infringement of your creative work, at the same time enable you to market your creativity. Members you share and communicate with. When you share and communicate using our Services, you choose the audience who can see what you share. For example, when you post your portfolio of creative work (files uploaded) on Hiya, you select the audience for the uploaded files, such as a customized group of individuals, all of your Friends, or Peer Group or Experts or for Everyone. Likewise, you give permission to get these files rated and ratings to be seen based on your customised selection criteria. Similarly, you select what contact details you want to share in the platform and with whom. You also post your views through blogs, which is available to be viewed by other members in the community without any prejudice. In some cases, members you share and communicate with may download (though we restrict download of the files) or re-share this content with others on and off our Services. When you rate or comment on another person’s creative files or like their content on Hiya, that person decides the audience who can see your comment or like. If their audience is public, your comment will also be public, and if the audience is friends or peers, your comment will be available to be viewed by that person’s friends or peers. Since Blog doesn’t have audience restriction, all comments related to a blog is available for public audience. Other people may use our Services to share content by you with the audience they choose. For example, people may share your creative file, share your blog, mention you in a post, or share information about you that you shared with them. If you have concerns with someone’s posts, social reporting is a way for people to quickly and easily ask for help from someone they trust. Any information you put on your profile and all your blog posts may be seen by others. However, your friend list and contact details are visible to others based on your privacy settings. Any content in the form of your portfolio of work that you post on Hiya as well their corresponding ratings by other members can be seen by others based on your privacy settings. We don’t provide any of your non-public information (like your email address) to third parties without your consent, unless required by law or for fulfilment of our services to you. We may host the application and the content in our own data centre or in a public well know Cloud provider. We will ensure that the privacy guidelines mentioned as part of this document will be adhered to. Also, if you have opted to bind any of your Service accounts to your Twitter, Facebook, Google+, Linkedin, Instagram or other similar account, you can easily share content from our Services to these third party services, in accordance with your account settings (which you may change at any time) and respective policies of these third parties. Further, we may allow third parties to look-up profile information (subject to your privacy settings) using your email address or first and last name information through its profile API. We want our advertising to be as relevant and interesting as the other information you find on our Services. With this in mind, we use all of the information we have about you to show you relevant ads. We do not share information that personally identifies you (personally identifiable information is information like name or email address that can by itself be used to contact you or identifies who you are) with advertising, measurement or analytics partners unless you give us permission. We may provide these partners with information about the reach and effectiveness of their advertising without providing information that personally identifies you, or if we have aggregated the information so that it does not personally identify you. For example, we may tell an advertiser how its ads performed, or how many people viewed their ads or installed an app after seeing an ad, or provide non-personally identifying demographic information (such as 25 year old female, in Madrid, who likes software engineering) to these partners to help them understand their audience or customers, but only after the advertiser has agreed to abide by our guidelines. You can manage the content and information you share when you use Hiya through various options available. You can delete your account any time. When you delete your account, we delete things you have posted, such as your creative files and Blogs. Keep in mind that information that others have shared about you is not part of your account and will not be deleted when you delete your account. We may access, preserve and share your information in response to a legal request (like a search warrant, court order or subpoena) if we have a good faith belief that the law requires us to do so. This may include responding to legal requests from jurisdictions across the world where we have a good faith belief that the response is required by law in that jurisdiction, affects members in that jurisdiction, and is consistent with internationally recognized standards. We may also access, preserve and share information when we have a good faith belief it is necessary to: detect, prevent and address fraud and other illegal activity; to protect ourselves, you and others, including as part of investigations; or to prevent death or imminent bodily harm. For example, we may provide information to third-party partners about the reliability of your account to prevent fraud and abuse on and off of our Services. Information we receive about you, including financial transaction data related to purchases made with Hiya, may be accessed, processed and retained for an extended period of time when it is the subject of a legal request or obligation, governmental investigation, or investigations concerning possible violations of our terms or policies, or otherwise to prevent harm. We also may retain information from accounts disabled for violations of our terms for at least a year to prevent repeat abuse or other violations of our terms. Hiya does not require that you accept cookies, and you may disable cookies at any time. However, some functionality of our Website may be impaired if you decline to accept cookies. For example: Cookies allow us to limit the number of times that you see an ad so you don’t see the same ad over and over again. For example: Cookies help us store preferences, know when you’ve seen or interacted with Hiya Services’ content, and provide you with customized content and experiences. For instance, cookies allow us to make suggestions to you and others, and to customize content on third-party sites that integrate our social plugins. If you are a page administrator, cookies allow you to switch between posting from your personal Hiya account and the page. For example: Cookies help us route traffic between servers and understand how quickly Hiya Services load for different people. Cookies also help us record the ratio and dimensions of your screen and windows and know whether you’ve enabled high contrast mode, so that we can render our sites and apps correctly. For example: Cookies can help us understand how people use the Hiya Service, analyze which parts of the Hiya Services people find most useful and engaging, and identify features that could be improved. Hiya has implemented security policies, rules and technical measures to protect and safeguard the personally identifiable information under our control from unauthorized access, improper use or disclosure, unauthorized modification, unlawful destruction or accidental loss. All our personnel that have access to, and are associated with the processing of your personally identifiable information, are obligated to respect the confidentiality of the information. Protecting the privacy of young children is especially important. For that reason, Hiya does not knowingly collect or maintain personally identifiable information on the Website from persons under 13 years of age, and no part of our Website is directed to persons under 13. If you are under 13 years of age, then please do not use or access the Website at any time or in any manner. If Hiya learns that personally identifiable information of persons under 13 years of age has been collected on the Website without verified parental consent, then Hiya will take the appropriate steps to delete this information. In order to delete the personally identifiable information you submitted, notify us at members@HiyaWorks.com that you wish to delete your personally identifiable information or any part thereof contained at our databases. Modification. If you wish to modify or update your personally identifiable information, use the Website or application interface. If you need help, please contact us at members@HiyaWorks.com Please note that deletion of your personally identifiable information from Hiya's database will not prevent Hiya from using gathered anonymous information. We have implemented security safeguards designed to protect the personal information that you provide in accordance with industry standards. Access to your data on our Services is password-protected, and data such as credit card information is protected by SSL encryption when it is exchanged between your web browser and the Services. We also offer secure https access to the HiyaWorks.com website. To protect any data you store on our servers, we also regularly monitor our system for possible vulnerabilities and attacks, and we use a tier-one secured-access data centre. However, since the Internet is not a 100% secure environment, we cannot ensure or warrant the security of any information that you transmit to us. There is no guarantee that information may not be accessed, disclosed, altered, or destroyed by breach of any of our physical, technical, or managerial safeguards. It is your responsibility to protect the security of your login information. Please note that emails, instant messaging, and similar means of communication with other Members are not encrypted, and we strongly advise you not to communicate any confidential information through these means. Please help keep your account safe by using a strong password.